Organizing social media posts can be quite tedious for any individual or business owner. There are so many platforms to keep track of; it can be a nightmare to remember it all. 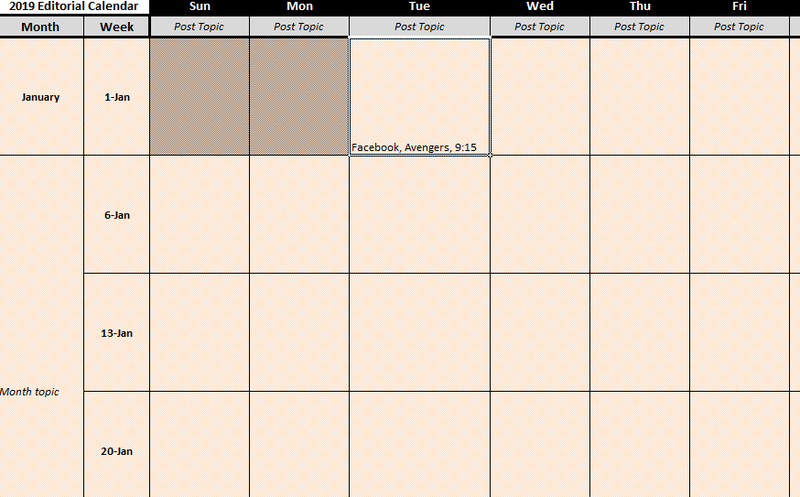 Luckily, the Yearly Social Media Calendar can help you sort everything into one neatly filed calendar template. There is nothing more convenient than looking at a specific day on a calendar and knowing exactly what to write. You don’t have to endure the torture of searching through hours of research articles to find the topic you need, just give this calendar a quick glance and you’ll be done for the day. To download the free template directly to your computer, just click the link provided at the bottom of this page! The template is designed like a simple calendar. Under the day of the week, listed at the top, just write the topic of your social media post, the time, and the platform in the corresponding box. There are two tabs on this document. The first tab will give you a view of all your posts for the entire year. The second will give you a view for the month. Ideally, you would enter a month-long topic in the second tab. This is a useful tool for people that commonly do a themed series of media posts. If you just want to list a different topic each day, stick to the “1-Year Page” tab”. Make your way through the months, writing all of the posts you have already planned out. Doing this will keep you a well-oiled media posting machine! Once you’ve finished writing out your posts for a month, you can print the document. This template is formatted to print 1 month per page. To print the document, press the “File” tab at the top of the screen and select “Print” from the proceeding drop-down menu. Now you have all the tools necessary to grow a thriving business through social media marketing!